This dish brings together Mediterranean ingredients with more everyday picks like chicken and cauliflower for a combined nutritional punch. Arugula, dates, olives and cauliflower, all superfoods, balance each other so that a range of healthy benefits present themselves. 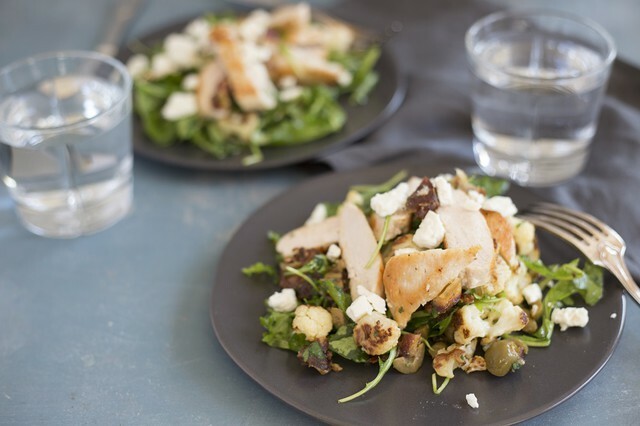 Order Sautéed Chicken with Cauliflower, Arugula & Date Salad by Sunday at midnight! Cauliflower is the new kale of superfoods! Of the brassica family, it is the member highest in vitamins like vitamin C. The nutrient benefits of cauliflower support the body's antioxidant, detox, and anti-inflammatory systems. Cauliflower's high fiber content also supports a healthy digestive system. Arugula is a good source of folic acid- especially important for pregnant women- as well as vitamins A and C. It is also one of the top veggie sources of vitamin K- needed for brain and bone health. Arugula is high in iron and copper- both essential for good health. Dates are now popularized thanks to their use in sweetening smoothies. They are a healthy alternative to adding processed, added sugars to a dish as they present a sweet flavor while also providing fiber, potassium, and a range of other minerals. Dates are known for reducing constipation, as well. Olives are high in fat, yes, but the type of fat is what's key. Three quarters of their fat is in the form of oleic acid- a monounsaturated fat. An increase in this type of fat is associated with a decrease in cardiovascular disease risk. Olives are also a good source of phytonutrients with antioxidant and anti-inflammatory properties. As always, a good way to round out this delicious meal is with a SuperFood Chocolate: Nicobella truffles. Purchase these vegan, organic chocolates in our online shop to experience superfood health benefits in chocolate form!